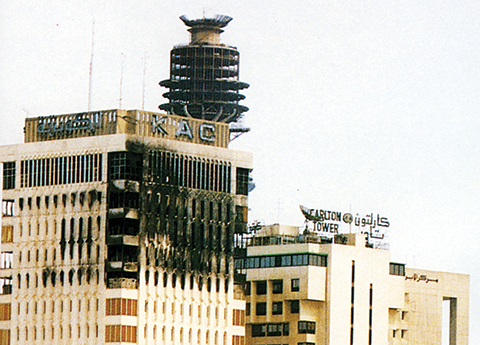 Kuwait Airways’ head office burned down by Iraqi soldiers during the invasion. KUWAIT: Today marks the 26th anniversary of the Iraqi invasion of Kuwait, which took place on August 2, 1990. The Iraqi Army attempted to erase the existence and identity of Kuwait and its people. The Kuwaiti people, home and abroad, immediately responded by uniting under the National Flag, where they fought and defended the country, its leadership and its freedom. Troops of the dictator Saddam Hussein went on a rampage, burning 752 barrels of oil and filling trenches with oil as a barrier between them and the coalition forces. It was under the guidance and leadership of the late Amir His Highness Sheikh Jaber Al-Sabah, the late Father Amir His Highness Sheikh Saad Al-Sabah, and His Highness Sheikh Sabah Al-Ahmad Al-Sabah, who was Foreign Minister of Kuwait at the time, and with the help of the people, that Kuwait was able to achieve its liberation. The international community offered its financial, political and moral support to Kuwait. The United Nations Security Council made a number of crucial decisions, starting with Resolution 660, in which it demanded the immediate withdrawal of the Iraqi forces under Chapter VII of the United Nations Charter. Arab countries also demanded immediate withdrawal of the Iraqi forces. The late Amir, His Highness Sheikh Jaber played a key role in mobilizing diplomatic support from the Arab and international communities in favor of supporting Kuwait and regaining its legitimacy and sovereignty. Kuwait declared that the Iraqi regime could not be trusted or dealt with as long as it was under the leadership of the dictator Saddam Hussein. Kuwait also declared that the Iraq’s people were victims of the dictatorial regime, and that they stand in solidarity with its people, an Arab and Muslim people just like them. During the invasion, His Highness Sheikh Sabah stated that “we distinguish between the Iraqi regime and the Iraqi people, and we are outraged that the people of our neighboring country must endure poverty and starvation.” His Highness stressed that Kuwait will continue to help the Iraqi people after the invasion, especially the refugees in the north and south. Kuwait and its people adhere to humanitarian principles that compelled it to return to providing support and aid to the Iraqi people in 1993. Under the direction of Sheikh Sabah, Kuwait Red Crescent Society (KRCS) provided aid and assistance to the refugees in Iraq and Iran in April of 1995, adamant to help support for the Iraqi people and to do so with kindness, love, and respect. In April 2008, Kuwait donated $1 million to the UN refugee agency to help in its operations aiming to lessen the suffering of the Iraqi people who do not have the most basic needs of food, water, health care and education. In November 2010, Kuwait announced offering $1 million to the UN agency to provide aid to the homeless who fled for safety reasons. During the 65th session of the Social, Humanitarian and Cultural and Social Committee of the UN General Assembly, the Kuwaiti diplomat, Hassan Shaker Abulhasan stressed that providing Iraq with protection and insuring people’s safety and security is a shared responsibility of the international community. On July 11, 2014, Kuwait donated three million dollars in humanitarian aid for Iraq to the UN refugee agency, and donated $200 million dollars in 2015. During the month of Ramadan of this year, Kuwait distributed 12,000 food parcels through its charity organizations in Kurdistan, and distributed 40,000 rations of food last year through the Kuwait Red Crescent Society. Separately, the news sector at the Ministry of Information has prepared a copious program to mark the 26th anniversary of the Iraqi invasion of Kuwait for today, a senior official has said. Assistant Undersecretary of the ministry’s news affairs and political programs Mohammad Bader bin Naji said yesterday that the program would focus on Kuwait’s bright image and its support to values of security, peace and humanitarianism. The news sector has prepared the program upon directives from Minister of Information and Minister of State for Youth Affairs Sheikh Salman Sabah Salem Al-Humoud Al-Sabah, to highlight the unity of the Kuwaiti people at the face of the invaders, which aroused the world’s support to Kuwait’s rights, bin Naji said. He highly appreciated backing by the ministry’s Undersecretary Tareq Eid Al-Mazram for all works produced by the sector, as part of a new media vision, considering Kuwait’s prominent status on the world scene, it’s the country’s distinguished and well-established ties with all countries since the independence in 1961.